Today’s retail supply chains need the flexibility to accommodate shipping demands - both tonnage and eaches - everywhere from distribution centers to stores to consumers themselves. The new supply chain should be designed as a network of multidirectional nodes to meet demand that can be fulfilled from “anywhere” within the enterprise. Retailers need to rethink how they will support more localized store assortments and complex “last mile” omnichannel fulfillment scenarios, without undermining buy-side efficiencies or over-inventorying fulfillment locations. 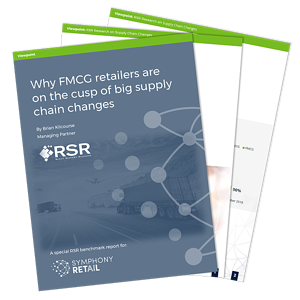 This special extract examines the responses given by FMCG retailers in RSR Research's latest benchmark study on the state of the Retail Supply Chain, and explores the challenges and opportunities they face in modernizing their supply chain processes.